Would it surprise you to know that it takes at least 13 different nutrients to properly create and convert thyroid hormone to its active form? Or that by replacing these nutrient deficiencies with thyroid supplements you may be able to REDUCE your symptoms of hypothyroidism? If you are considering taking supplements to boost your thyroid function to help you feel better there are some things you need to know FIRST. ​Not all supplements are created equal and everyone out there claims to have the "best product". 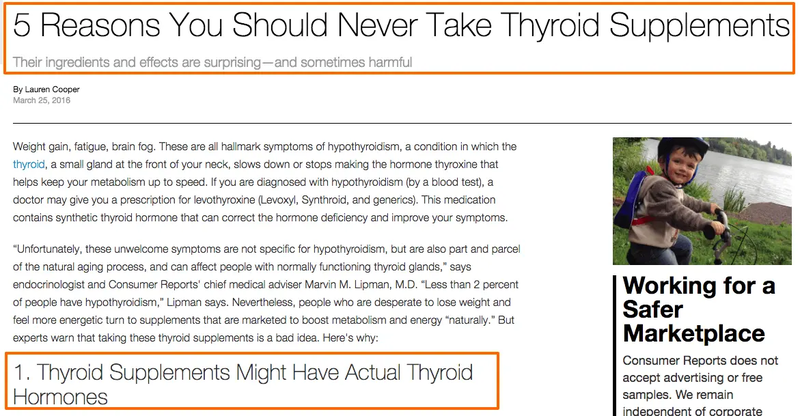 ​I've been treating hypothyroid patients for years and I've found certain supplements help thyroid patients feel better and I want to share these with you. Many run-of-the-mill Thyroid Supplements contain all of the nutrients that MIGHT help thyroid function, but that's the wrong approach. A better one is to find what your body is deficient in and then give back what it needs. And it just makes sense, right? If your body lacks Zinc, for instance, then your immune system will function less optimally (1) until you restore those nutrients back to normal levels. ​And, this isn't made up guys - there are many studies showing how common even basic nutrient deficiencies are and what kind of symptoms to expect with those deficiencies. ​These types of articles would have you believe that taking supplements isn't helpful and in fact might be harmful. Remember when I said it takes at least 13 different nutrients for proper thyroid hormone production and conversion? A deficiency in ANY of these may cause limited thyroid function leading to a reduced quality of life and hypothyroid-like symptoms. Does that mean you should just blindly take these nutrients? Instead, my goal here is to walk you through how to properly and safely use targeted supplements to help naturally improve your thyroid. The 9 nutrients below have been hand-picked by me because I think they are the MOST beneficial for thyroid patients. This is based on my personal experience and in treating over 1,000 patients. May Boost Energy levels and reduce fatigue. May help increase metabolism and fat loss. Helps improve mood and may increase concentration. Generally works very quickly (within 1-2 weeks). Based on studies as many as 40% of patients with hypothyroidism are ALSO vitamin B12 deficient (5). ​Do you see the problem here? Many of these symptoms are also symptoms of hypothyroidism so you may be walking around with both issues contributing to how you feel. This means that you may be taking the right type and dose of thyroid medication but your symptoms may persist if you don't also replete your Vitamin B12 levels. And this very problem is something that I see frequently among thyroid patients. You might think it's fairly easy to diagnose B12 deficiency but it's not as easy as you might think. One major problem with B12 testing is that it is notoriously inaccurate if you look only at your blood tests. To make matters worse, many physicians are not aware of how to test for B12 deficiency, or if they do they often order the wrong lab tests. The main problem with this test is that it doesn't tell you how well your body is processing Vitamin B12 or if B12 is making it into your cells. You can bypass this problem by looking at other markers in the bloodstream which can be used in conjunction with your serum B12 to get a better idea if you are really deficient. MCV (Mean corpuscular volume): The MCV gives you an idea as to the general size of your red blood cells. People with B12 deficiency often have larger than normal red blood cells. Homocysteine levels: High levels of homocysteine can be an early indicator that your body is having issues in processing vitamin B12 into its active form. Urinary organic acids and methylmalonic acid: These tests give you information about the by-products of Vitamin B12 metabolism and can help you determine if you are deficient. In my experience, almost all patients with thyroid disease benefit from using B12, but in order to feel relief, you may have to use it the correct way. Taking it by mouth (either sublingually or orally in a capsule/liquid) or taking a Vitamin B12 shot. In certain individuals, especially those with gastrointestinal issues, taking Vitamin B12 orally may not be the best idea. These GI issues may impact or blunt absorption which limits how much B12 is actually making it into your body. You can bypass the gastrointestinal tract by getting a Vitamin B12 shot. B12 shots put pre-methylated and pre-activated B12 directly into your system and muscles were they are directly available for use. B12 shots should be considered if you've already tried oral or sublingual B12 without success or if you can't seem to push your B12 levels up. Another consideration when using B12 is your genetic MTHFR defect status. The MTHFR gene encodes a gene which is responsible for helping your body to activate vitamin B12 so that it can be used directly by your body. Up to 40% of individuals today have small to large changes in the genes which encode for the proteins and enzymes involved in this reaction. If you have this genetic defect (you can check your genetic status rather easily) then you may have difficulties in activating B12 after you ingest it. You can bypass this problem by using pre-activated (or pre-methylated) formulations of Vitamin B12. Don't let this necessarily scare or concern you, but this genetic defect may explain why some people take B12 but don't experience any benefit, especially if they are using cheap formulations of B12 such as cyanocobalamin. If you decide to use B12 make sure you are using either methylcobalamin or hydroxycobalamin. I find that patients with thyroid problems do better when they take Vitamin B12 in addition to other B Vitamins. Most of the time, if you are deficient in B12 then there is a high probability you are also deficient in the other B vitamins as well. If you decide to use B12 make sure you find a B Complex which contains pre-activated and pre-methylated B12 and other B vitamins as well. This will ensure that your body can utilize all of the B vitamins you ingest and it also reduces the dose necessary to obtain results. 1-2 capsules per day of a pre-methylated and pre-activated B complex should do the trick. Many hypothyroid patients suffer from both thyroid and adrenal problems. Ideal to help promote increased energy and well being. May help improve stress response system in your body. Most patients experience improvement in 1-2 months. Adrenal support refers to the use of nutrients and vitamins which help your adrenal glands produce powerful and important hormones such as cortisol. Cortisol is a hormone released in times of stress which helps thyroid hormone (and other hormones) function. By repeatedly taxing your adrenals (through stress or through thyroid dysfunction) you can cause adrenal-related issues which create a cascade of very specific symptoms. This is important for your thyroid because we know that thyroid hormone is intricately linked to adrenal function. As your TSH increases (hypothyroidism) your cortisol levels will rise as well (7) leading to the symptoms of adrenal fatigue. This connection explains why so many thyroid patients also suffer from the symptoms of adrenal fatigue. But perhaps even more important is the fact that treating yourself with thyroid hormone may not be sufficient to "heal" your adrenal glands. The presence of these symptoms indicates a disruption in cortisol. This disruption can either be at the cellular level or it can be in the absolute concentration of cortisol in your serum. You can test for the presence of adrenal-related issues by looking at the hormone cortisol. Cortisol can be tested in your serum, in your urine, and/or in your saliva. Each of these tests has its pros and cons and one test is not necessarily better than the other. I used to routinely recommend salivary cortisol testing for many patients but have since changed my tune. More recently, I've been using serum cortisol as a "general" assessment of adrenal function and treating based on those results. You can't go wrong with any of these tests and my general recommendation is to go based off of your symptoms (and not your lab/urinary/salivary tests) as they can be inaccurate in certain situations. There are two ways to approach fixing adrenal problems with supplements and vitamins. You can use adrenal glandulars (#1) or adrenal adaptogens (#2) or a combination of both. Even though we are going to primarily focus on the supplements today (that's the purpose of this article, after all) you should be aware that other lifestyle therapies should also be employed if you have adrenal issues. Dietary changes, meditation, stress reduction techniques, improving your sleep, and so on should all be considered mandatory elements of your treatment plan if you have adrenal issues. Once you have determined you have cortisol-related issues you can determine how to proceed with treatment. Low cortisol can be addressed with adrenal glandulars and adrenal adaptogens, while high cortisol can be addressed with phosphatidylserine (8) and adrenal adaptogens. Note: It isn't always necessary to check for your cortisol prior to using adrenal supplements as sometimes your cortisol level may not "match" your symptoms. Adrenal adaptogens are plant-based compounds which help you increase your stress tolerance by "nourishing" the adrenals. They are often combined with vitamins and nutrients which form the building blocks for hormones such as cortisol and adrenaline. Of the adaptogens, Rhodiola Rosea may be the most stimulating for the body which peaks around 30 minutes after ingestion (9). Adaptogens can also be used in combination with adrenal glandulars which is one of my preferred methods for treatment. Adrenal glandulars, or desiccated adrenal gland, contain portions of animal adrenal glands which contain hormone precursors and vitamins specific to the adrenal gland. Don't let this information confuse you, though, because you can't go wrong in using either adrenal adaptogens or adrenal glandulars. I've found, based on my experience, that most people do exceptionally well when combining both together. My preferred supplement has shown improvement for most people with thyroid-related issues. Treating your adrenals has a compounding effect in which it can potentially improve both your thyroid function and your adrenal function simultaneously. Zinc is perhaps one of the most important and often missed, nutrient deficiencies found among hypothyroid patients. In fact, there is a good chance that you have sub-optimal levels of Zinc present in your body as you are reading this. And this doesn't bode well for your thyroid, given how many thyroid processes Zinc is involved in. One of the most important of these functions is the role that Zinc plays in the conversion of T4 to T3. Because zinc is required for thyroid conversion (T4 to T3 conversion), low levels of zinc may predispose you to develop high levels of reverse T3 and which may limit thyroid function (10). These changes can also be identified through lab tests as low free T3 and low total T3. Enhanced immune function (11) - This is particularly important if you have Hashimoto's thyroiditis or other autoimmune diseases. Acts as an anti-inflammatory agent - Helpful in those with Hashimoto's or other causes of thyroiditis. Plays a role in reducing oxidative stress. A severe deficiency in zinc may result in hypothyroid symptoms which can be reversed with supplementation (12). Zinc deficiency is also associated with hair loss and alopecia, a troubling symptom that many hypothyroid patients face despite taking thyroid medication. The real benefit to using Zinc is that supplementing may help to improve thyroid function (if you are deficient) and help to reduce hair loss and improve hair quality. Testing for Zinc in the serum or plasma is generally not recommended as many people with "normal" values still present with the symptoms of Zinc deficiency. This idea was highlighted in this study which showed that the best way to confirm and treat zinc deficiency is with a trial of zinc supplementation, in fact, this is considered to be the "gold standard" (13). If you suspect that sub-optimal Zinc levels may be contributing to your hypothyroid symptoms then a trial of zinc may be appropriate. Zinc is an incredibly important mineral if you have hypothyroidism, but I've found that most thyroid patients experience superior results when they combine zinc with other nutrients. This benefit is most likely related to the synergistic effect that multiple nutrients have on thyroid function. It's probably also due to the fact that many people with Zinc deficiency probably also have other nutrient deficiencies. If you combine Zinc with Selenium (and other nutrients) the total dose necessary for either will decrease and you will obtain the same benefit at a smaller dose. The dosage of zinc necessary to improve thyroid function varies anywhere from 5mg up to 50mg per day. If you are severely zinc deficient then you may benefit from using a higher dose (toward the 50mg per day range) for 1-2 months. This will allow you to build up your zinc 'storage'. Once you have repleted zinc stores in your body, you can safely back down to a smaller daily dose which is just as effective in helping to improve thyroid function. If you decide to use Zinc make sure you find a supplement which has Zinc bound to either 'Citrate' or 'Picolinic acid'. These formulations of zinc tend to be better absorbed compared to other formulations. My recommended Zinc supplement contains an array of nutrients in addition to zinc and is probably best for those people who are not severely zinc deficient (if you are severely zinc deficient then you may need a higher dose). I know I sound like a broken record here but Iron is another huge player when it comes to your thyroid. But it is also unique among the nutrients that I am going to discuss in this article because it's not something that you want to take unless you are sure you are deficient. Other nutrients such as Vitamin B12, Zinc, Selenium, etc. are considered to be incredibly safe nutrients that you should be able to take and tolerate without issue. Iron, on the other hand, can potentially be harmful to your body if you use it without a documented deficiency. It's certainly safe to use, but it should only be used if you know you are deficient. Now, with that warning out of the way, let's go back to how iron impacts your thyroid. It's so important I've dedicated an entire post to it that you can read here, which outlines how hypothyroidism is worse in the presence of iron deficiency. Iron is involved in the production of thyroid hormone from your thyroid gland. Low levels of iron, therefore, worsen existing thyroid function (make your symptoms worse) (14). In addition, as thyroid levels fall (even slightly) your body will have a difficult time absorbing iron in the intestinal tract. This sets you up for further iron deficiency and worsening thyroid function. What makes matters worse is that most physicians don't treat iron deficiency unless it also is causing anemia (low red blood cells). But it's certainly possible to have an iron deficiency which doesn't cause anemia but which impairs thyroid function in your body (15). Identifying iron deficiency is actually quite easy and can be tested with routine blood work (more on that below) and combined with your symptoms. To identify this problem all you need to do is ask for basic "iron studies" with your next set of blood work. Once you have these labs you will want to focus on your ferritin level which tells you how much iron you have stored in your body. Low levels of ferritin are associated with iron deficiency and impaired thyroid function. You can also identify the presence of iron deficiency by assessing your clinical symptoms. Again, notice the similarities between iron deficiency symptoms and the symptoms of hypothyroidism. Often times it's difficult to differentiate between these nutrient deficiency syndromes and hypothyroid symptoms unless you know to CHECK and understand your labs. Don't make the mistake in assuming that your Doctor will understand this information, you may need to be an advocate for your own health, especially when it comes to using Vitamins and supplements. Once you have identified the presence of low iron you can begin treatment with over the counter iron supplements (but just be sure to do this with physician supervision as too much iron can be harmful). You may find that your labs are considered "normal" but they may not be optimal. As a thyroid patient you really need these results in the "optimal" range otherwise you may not feel improvement. You can see that while these lab tests are within the "normal" range, they are not in the new "optimal" range that I've listed above. This patient has a normal iron of 80, but you can see that this iron level is certainly on the low end of the normal range. In addition, her ferritin of 46, while normal, is not optimal for thyroid function or for hair growth. Ensuring that your ferritin is in the 50-60 ng/mL range will help with hair growth and symptom management. One downside to using iron supplements is that they often cause constipation and/or abdominal pain. This is a well known and documented side effect but it is usually only seen when using the prescription iron tablets and capsules. Because hypothyroidism already causes constipation it's not ideal to worsen existing gut motility if at all possible. The good news is that you can take iron without experiencing constipation if you use liquid iron instead of iron tablets. Liquid iron also contains certain cofactors required for the absorption of iron in the intestinal tract (16) which can make it more effective than just taking iron by itself. Iron is also notorious for disrupting the absorption of nutrients and even medications if you take them both at the same time. And this extends to those who take iron for iron deficiency and thyroid medication for hypothyroidism. Taking iron at the same time as your thyroid medication can inactivate your thyroid hormone and reduce how much makes it into your body! You can avoid this issue by ensuring that you take your thyroid medication at least 2-4 hours AWAY from your thyroid medication. Because of this interaction, I usually recommend that patients take iron at the opposite time of the day as their thyroid medication. If you take your thyroid medication at night then take your iron in the morning or vice versa. You can also ensure better iron absorption by consuming Vitamin C or a glass of lemon water when you take your iron supplement. If you are deficient, taking 1-2 teaspoons of liquid iron should be sufficient to help improve your iron levels. Magnesium is another big player for hypothyroid patients because hypothyroidism causes dysregulation of magnesium metabolism. Hypothyroid patients may actually have normal serum and RBC magnesium levels but studies have shown decreased intracellular amounts of magnesium (17) in these patients. ​That means you can't always trust our limited laboratory tests when evaluating if you are deficient! (The same can be true of other serum 'nutrient' tests, which is why I don't always rely on them). These studies also show that both magnesium and zinc appear to be lower in hypothyroid patients due to increased clearance of both nutrients in the kidneys (18). You really don't want to be deficient in this nutrient - because a deficiency can cause a number of symptoms ranging from heart problem﻿﻿s (19) (arrhythmia) to nervous system disorders. ​So how do you know if you should supplement with Magnesium or if you are deficient? I'm not a huge fan of magnesium testing simply because it is highly inaccurate, but if you prefer this route you are welcome to test for it. Serum magnesium - if using this test, you'll want your results somewhere between 2.0 and 2.2 mg/dL. RBC magnesium - if using this test, you'll want to ensure your results are somewhere between 6.0 and 6.8 mg/dL. Both give you a general idea as to how much magnesium is floating around in your bloodstream but they don't necessarily tell you if that magnesium is entering into your cells (which is where you want it). Because magnesium is so safe to use, it's probably better to assume deficiency if you are symptomatic and to treat based off of that knowledge. Dosing magnesium is actually quite easy. Most people do well and can sustain normal serum magnesium levels with a dose somewhere between 100mg and 200mg per day. Some individuals may need less and some more, but somewhere in that range will work for 95+% of people reading this. Reasons to increase your dose may include persistent symptoms of magnesium deficiency or chronic constipation. There are many different types of magnesium supplements available for over the counter use. 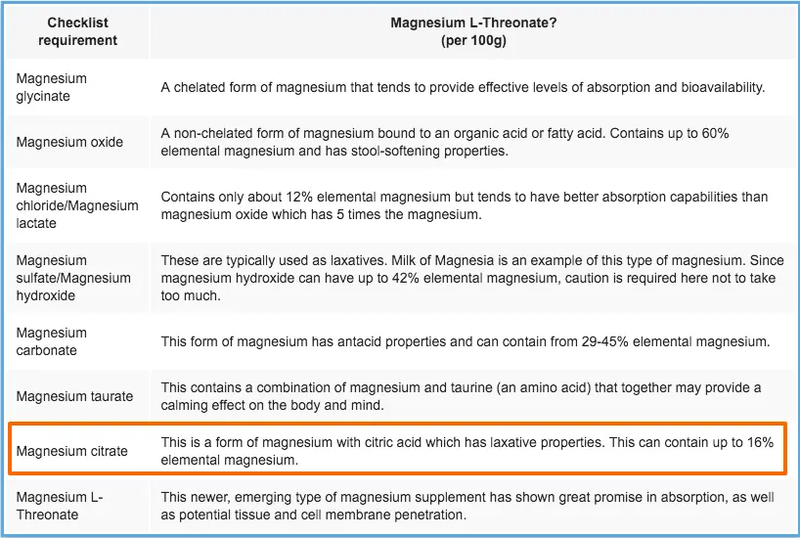 The formulation that you want to stick to if you have thyroid disease is magnesium glycinate (a runner-up would be magnesium citrate). Magnesium glycinate is highly absorbed and is ideal for getting enough magnesium into your body in a short period of time. Glycinate should also not cause loose stools (like other forms of magnesium). If you suffer from chronic constipation, however, you may want to consider using magnesium citrate. This formulation leaves more magnesium in your GI tract which stimulates your bowels. That means less magnesium will make it into your body, but it may help treat constipation. When in doubt, start with 100 to 200mg of magnesium glycinate per day! I'm sure you've heard about Selenium if you have hypothyroidism and especially if you Hashimoto's thyroiditis. Because not only is Selenium involved in the T4 to T3 conversion process (21), there are also some studies that show that supplementing with Selenium can help r﻿﻿educe TPO antibodies (22). How does selenium help improve these processes? Selenium is a trace mineral which forms the backbone of a specific set of proteins known as selenoproteins. These proteins catalyze important functions such as the creation of thyroid hormone and the creation of anti-oxidants in the thyroid gland (23). Insufficient Selenium levels may impair the function of these proteins and predispose you to develop low thyroid hormone and thyrocyte damage (damage to your thyroid cells). Studies have shown that supplementing with Selenium may help improve thyroid function and reduce thyroid antibodies by providing your body with this important mineral. Selenium is also a powerful anti-inflammatory agent (24) and using this nutrient may potentially help reduce inflammation (and autoimmunity) in certain patients. You can find more information about symptoms of Selenium deficiency and an in-depth analysis here and how Selenium helps improve your thyroid here. All patients with hypothyroidism and Hashimoto's thyroiditis should be evaluated for Selenium deficiency and treated if necessary. Like Zinc, a trial of selenium may be the best way to determine if you will benefit from using it. Doses of at least 100mcg per day have been shown to be effective (25). But what about your dose? Most of the nutrients we have discussed up until this point are fairly safe, even if used in large amounts. But Selenium is not one that you want to take more than necessary. Doing so may cause negative symptoms such as hair loss, diarrhea, fatigue, and nail issues. You can avoid these symptoms by keeping your daily dose of Selenium less than 400mcg per day (at the very extreme end). Most people will not need anywhere need this dose, however, as humans only need around 70mcg of Selenium each day. Supplementing with 70mcg to 150mcg per day works best for most thyroid patients. Some people, especially those with Hashimoto's thyroiditis, may benefit from the higher 400mcg per day dose. As a thyroid patient, you will probably get better results by combining Selenium with other minerals such as Zinc and Iodine. I think probiotics are a potentially easy and great way to boost your thyroid naturally. But what do Probiotics and Thyroid function have in common? For starters, about 20% of T4 to T3 conversion occurs in the gut (26). What this means for you is that intestinal issues (more on those below) can negatively impact this percentage. This may mean less free T3 and total T3 for your body. In addition, inflammatory conditions in the gut (27) predispose the body to develop autoimmune diseases and worsening thyroid function. ​So how do thyroid function and the gut play together? It turns out that thyroid hormone helps the body produce stomach acid (which helps with digestion) as well as promoting peristalsis - the slow movement of the GI tract. Low thyroid hormone promotes low stomach acid which promotes intestinal issues, nutrient deficiencies, and the overgrowth of certain bacteria and fungi. Low thyroid hormone also promotes a sluggish GI tract which predisposes the body to develop constipation, SIBO, and yeast overgrowth syndromes (like Candida). 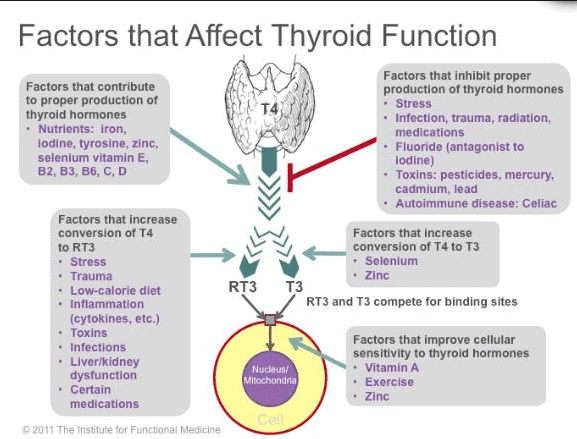 Both syndromes cause inflammation which can promote autoimmunity and thus either directly damage the thyroid or lead to decreased T4 to T3 conversion. Do you see the cycle here? This is exactly why it's so critical to evaluate and treat any GI related issues that you may have because they are either caused by hypothyroidism and/or they are making your thyroid function WORSE. It's easy to assume that your gut health is fine and is not dragging down your thyroid, but is that really the case? You might assume that you have no intestinal issues, but it would be a good idea to really define what a healthy "gut" actually looks like. I'd be lying if I said that taking probiotics will cure your GI problems, but they are certainly a good place to start. Ultimately, you will probably need to alter your diet, change how frequently you are eating your food, and take additional supplements to fix your gut. Probiotics play an important role in helping to regulate your intestinal bacterial concentrations, in restoring gut lining integrity, and in promoting appetite and hormone balance. The use of specific probiotics can help improve or resolve many of these issues if you have them. The key to using probiotics effectively is to use probiotics which contain the right species of probiotics at the right concentration (dose). My experience suggests that thyroid patients do best on probiotics which have over 100 billion CFU in each serving. In addition, you will want to use probiotics that contain at least 10+ different species of bacteria (with a healthy mix of both bifidobacteria and lactobacilli species). I typically recommend that patients start off with a burst of high dose probiotics (300+ billion CFU per serving) for 15-30 days and then transition down to 100 CFU per serving probiotics daily for several months. This strategy is ideal for those with weight issues, multiple hormone imbalances, immune issues, Hashimoto's thyroiditis, and other thyroid issues. This probiotic is great for daily use and for gut health maintenance. It contains 100 billion CFU of probiotics as well as the most studied bifidobacteria and lactobacilli strains. If you don't elect to use my recommended probiotics do make sure that you find a probiotic which has at least 10+ species and 100+ billion CFU per serving. ​Ensure that your probiotic has several species of bifidobacteria (28) and lactobacilli species (29) as these species are the most well studied. Also, remember that probiotics must be packaged correctly to ensure that you receive the highest concentration of bacteria per serving when you ingest it. May help reduce acid reflux or GERD. Helps break down food particles. May help promote normal bowel movements. Helps promote proper nutrient absorption. Enzymes make their way into the list because of how important they can be in helping your body break down nutrients but also medications. As you already know, low thyroid = low stomach acid (30) = poor digestion. But what you might not be aware of is how difficult it can be to break down certain medications (even thyroid hormone) when you have low stomach acid. For this reason, in patients who have BOTH hypothyroidism (or Hashimoto's) plus GI related issues, I recommend that they also take enzymes to help with digestion. In fact, I have seen some patients with Hashimoto's who start taking NDT cause a temporary spike in antibodies as a result of this poor digestion. The inability to break down food products completely results in abnormal absorption of particles that your body isn't used to seeing which may influence autoimmunity (31). I generally recommend a trial of enzymes with every meal (and in between meals) if you have Hypothyroidism or Hashimoto's PLUS gut issues (GERD, IBS, IBD, chronic constipation, SIBO or yeast overgrowth). It's also worth mentioning that taking enzymes in between meals can help promote the breakdown of immune complexes (30) in the bloodstream. So take enzymes WITH food and WITHOUT. Iodine is another nutrient that deserves its own blog post (for more info please see this article) - but I do want to give it some well-deserved attention here. Stating that iodine is involved in thyroid hormone production is an understatement. The iodine moiety on thyroid hormone is what MAKES thyroid hormone active. In fact, 4 iodine molecules help create T4 and the removal of 1 iodine moiety by deiodinase enzymes can either activate or inactive thyroid hormone. These deiodinases help regulate the conversion of T4 to T3 and help maintain cellular T3 activation (or inhibition). It should come as no surprise then that if you are deficient in iodine you will have problems creating thyroid hormone. If you can't produce enough thyroid hormone then you will experience the symptoms of hypothyroidism. Iodine is an essential nutrient which humans MUST get from their diet (or supplements). We can not create it ourselves and we need it to function. Insufficient iodine is associated with hypothyroidism and low IQ in newborns if the mother is deficient. This is why the government places iodine in certain foods (such as salt). The problem doesn't come with knowing its importance but with understanding how to supplement with it correctly. Taking excessive iodine can be harmful to your thyroid gland while taking an insufficient amount can be damaging as well. Iodine, like iron, is another nutrient you don't want to have too much of, just like you don't want to have too little. Finding that balance can be difficult. Another problem with Iodine supplementation is that it can displace other halides (31) which stick on to thyroid hormone molecules but inactivate the thyroid hormone. I'm talking about fluoride, bromide, and chloride. 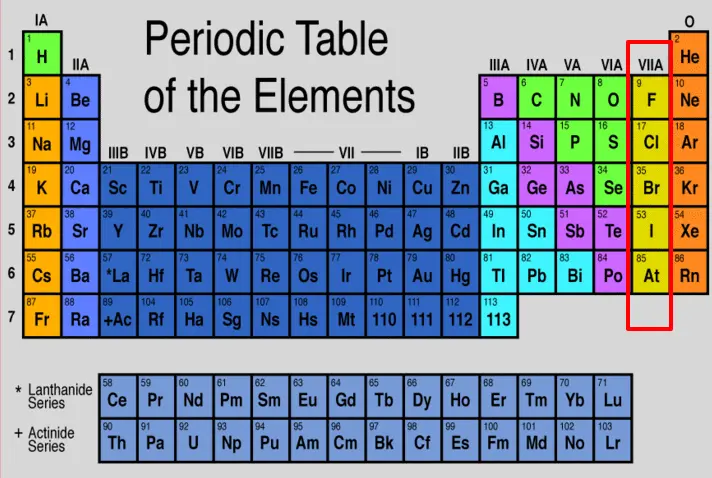 You can see from the image above that Iodine, Fluoride, Chloride, and Bromide all share a similar structure in terms of their electron outer shell. What that means to you is that these other chemicals can displace iodine on thyroid hormone and cause a cellular hypothyroidism with "normal" thyroid labs. And, when you give a patient who has this issue iodine - it may displace the other chemicals and cause a detox reaction. The detox reaction shares the symptoms of bromoderma and bromism (but usually not as severe). ​The detox reaction can present as worsening thyroid symptoms, acne, pustules in the face, nausea/vomiting, irritability, etc. Some people are hesitant to use iodine because they believe it is dangerous and that it may make their thyroid function worse. This fear is largely unfounded, provided you use the appropriate dose of iodine. There are several stories, even some on this blog, of patients reporting that taking high doses of iodine triggered Hashimoto's in their body. Some clinical studies also confirm that there is a relationship between the development of Hashimoto's and iodine use (32). My personal opinion is that iodine is not necessarily causing Hashimoto's in these individuals but accelerating the disease which probably would have eventually established itself at some point in the future. This potential outcome, while rare, can be avoided by taking iodine with other thyroid-protective nutrients such as Selenium. You can also protect against negative outcomes by taking a low to moderate dose of iodine and by avoiding excessively high doses. Some people are able to take 25 to 50mg (milligrams) per day without any issue. These people often recommend that everyone takes doses in this range. To put this into perspective, 1mg is equal to 1000mcg. So 25mg of iodine is equal to 25,000 mcg or roughly 125x the dose that I recommend. You may be able to titrate up to that dose without harm, but the potential negative effects outweigh the small potential benefit in my opinion. Stick to doses of 75mcg to 200mcg per day and take your iodine with Selenium and Zinc and you shouldn't have any issues. To date, I have only had 2 documented scenarios in which patients truly reacted negatively to Iodine supplementation and many more patients who have done quite well on Iodine. While this is anecdotal evidence, it may calm your mind to know that out of thousands of people who have taken iodine very few reacted negatively to it. If you start with a low dose (100-200mcg per day) then you can easily reduce or stop taking iodine quite easily. If you experience the side effects of bromism or bromoderma, then cut your dose and try again after several days. Experiencing acne or a rash after taking iodine does not mean you don't need iodine, but it may mean your dose is too high. But they shouldn't be used alone. Thyroid supplements should be used as part of a treatment plan that attempts to remove all negative stressors from the life and put back in the things which your body lacks. For more info on where to start adding in these other areas please see my post here. What supplements have worked for you? Which ones haven't?